This small bird is brilliant orange in color with a black ‘mask-cap’ on the head. It gets the appellation ‘snowy crowned’ from the streak on white feathers found on the very top of the head. 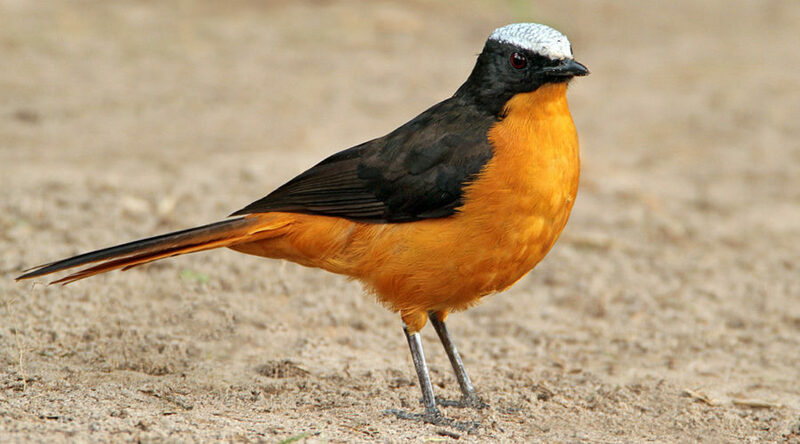 Originally grouped in the same family as thrushes, new molecular evidence puts the Snowy-crowned Robin Chat to in with the Old World Flycatchers. As the name implies, this enormous family group are insect-eaters, preferring to catch their food on the wing. Common throughout its range, this small, noisy bird prefers to hide in woodland habitats, but adapt well to human habitation when necessary. Both female and male Robin Chats are involved in building the nest, but only the female incubates the eggs. Both parents care for hatchilings. Despite being commonly found throughout their native range, very little is known about the wild habits of this species.